13 January - Edward Carson founded the Ulster Volunteer Force. 30 January - The House of Lords at Westminster rejected the 3rd Home Rule Bill. 7 July - The House of Commons again carried the Home Rule Bill in spite of attempts by Bonar Law, leader of the Conservatives to obstruct it. 26 August - Members of James Larkin's Irish Transport and General Workers' Union employed by the Dublin United Tramways Company began strike action in response to the dismissal of trade union members by the chairman, William Martin Murphy. Murphy responded to this action by ‘locking out’ strikers and installed non-union workers. Disputes spread across the city until over 20,000 workers were involved. 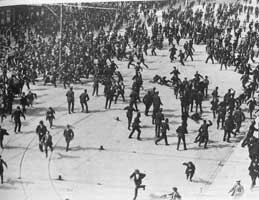 These strikes and lockouts led to mass demonstrations and rallies, police charges and riots which continued until early 1914. 8 September - September 1913 by W.B. Yeats published in the Irish Times as Romance in Ireland. It is an attack on Dublin Corporation’s reluctance and eventual refusal to house a collection of paintings belonging to Sir Hugh Lane, a young, wealthy, single-minded art collector (and nephew of Lady Gregory). It is also an attack on what Yeats saw as the lack of heroic, romantic values and the rise to prominence of bourgeois materialism. 17 September - Edward Carson threatened that a Provisional Government would be established in Ulster if Home Rule is introduced. 27 September - 12,000 Ulster Volunteers paraded at the Balmoral show grounds in Belfast in protest at the Home Rule Bill. 27 October - James Larkin was sentenced to seven months in prison for seditious language. 1 November - Professor Eoin MacNeill's article "The North Began", which advocated the formation of nationalist Irish Volunteers, appeared in the Gaelic League newspaper An Claidheamh Soluis. 19 November - The Irish Citizen Army was founded by James Connolly to protect workers in the strikes and lockout. 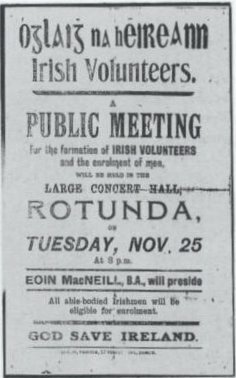 25 November - The Irish Volunteers were formed at a meeting attended by 4,000 men in Dublin's Rotunda Rink. 28 November – Conservative Party leader, Bonar Law, addressed a huge unionist rally in Dublin, and declared that if Home Rule was introduced Ulster would resist and would have the support of his party.